Some Spring days can still be a little chilly. Duster and trench coats are the perfect way to still wear your Spring outfits, but stay cozy at the same time. I have yet to find a nice trench coat to invest in but for now, I have a few light weight dusters that I can wear instead. This one in particular is from Forever 21 and I got it on sale for literally $10! I have a love/hate relationship with Forever 21's sale section because it can be so frustrating to look through everything, but once you find a gem, it ends up being an amazing deal. 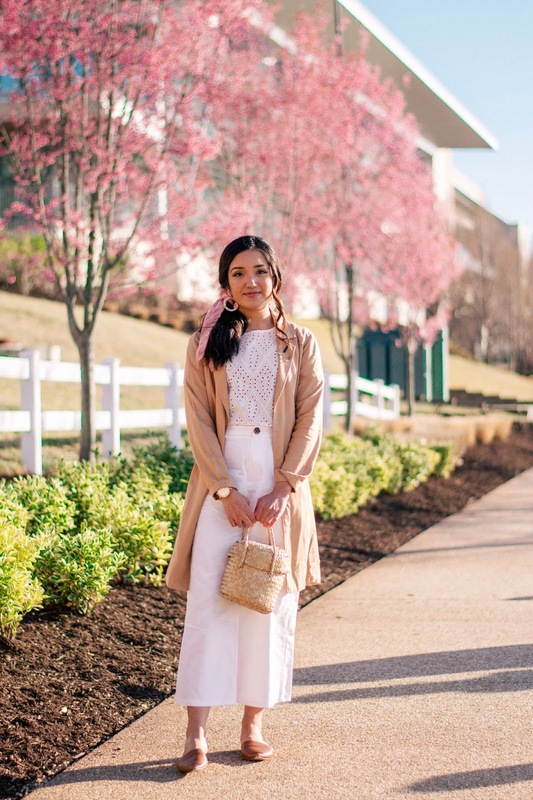 My favorite blogger for my Spring and Summer inspiration is Julia Engel and you can check out her BEAUTIFUL blog my clicking here! She is always wearing light and colorful outfits which is exactly my color palette for the warmer months. That is what inspired this light pastel look for me. 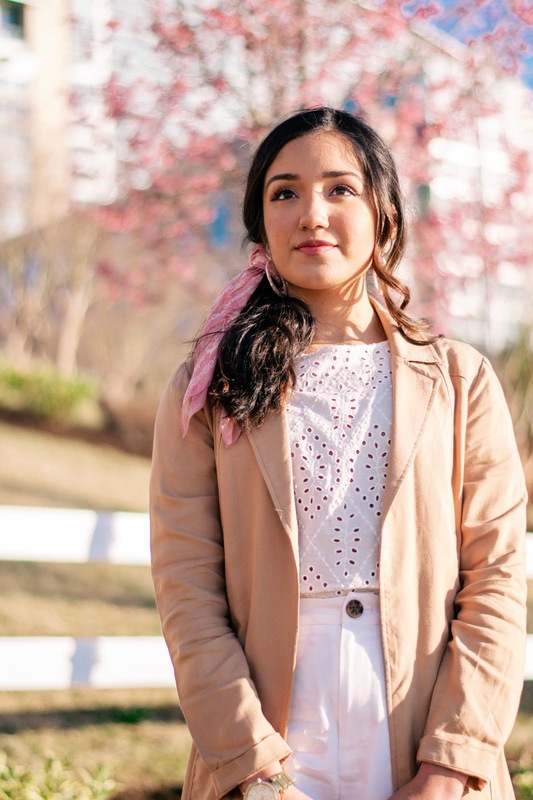 My best friend Imaan and I decided to go out to National Harbor for this nice Spring day and we were so happy to see that some of the flowers had started to bloom! I knew I wanted to wear some pink accessories with this look because that is my go to color in the Spring and Summer seasons. Julia tends to wear really pretty scarves in her hair and although my hair isn't as long as it used to be, I still decided to try this look out for myself and ended up loving the way it came out. 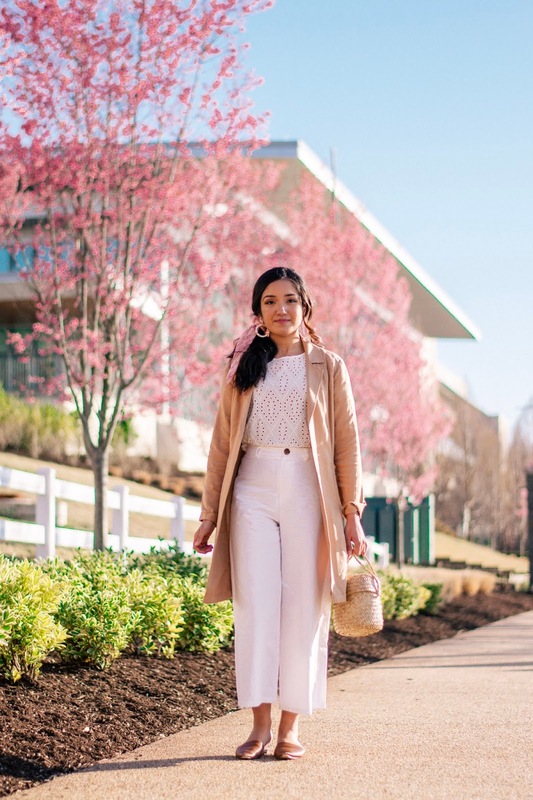 I love a pair of crisp white pants during this time of year so I decided to bring these wide leg ones out for this look paired with this feminine white eyelet top. If you have been following me for a while, you will know that I have a great love for basket bags and so I knew I had to bring out my trusty basket bag from Doen that I've has for almost 2 years now. I wanted to be comfortable because I knew we would walk around quite a bit, so I opted for these pointed toe slides which go with just about everything. As for the rest of my accessories, I went with some statement pink earrings, as well as my gold watch. Let me know what your favorite part of this look was and if you'll be buying a duster coat for Spring yourself!